Another Decade to Wait for Meaningful GIPSA Antitrust Enforcement? Hell No! We had our day in court. On Wednesday, the U.S. Court of Appeals for the Eighth Circuit heard oral arguments in our lawsuit challenging the U.S. Department of Agriculture’s unlawful rollback of critical protections designed to safeguard family farms and ranches from predatory and retaliatory practices by big agribusiness corporations. Appearing on behalf of the Organization for Competitive Markets (OCM) and independent farmers, Democracy Forward argued that USDA acted unlawfully in withdrawing the Farmer Fair Practices Rules, or GIPSA Rules, last year. USDA Secretary Perdue rescinded the Rules—the product of a nearly 10-year rulemaking process—which were designed to help level the playing field for poultry and livestock farmers and ensure fairness in the production of our country’s food. In response to our arguments, Perdue’s attorney told the court that USDA was planning to re-start the process of setting the criteria for farmers to bring action against corporate market abuse—in 2019. Even if USDA is true to its word, 2019 is too late for farmers to wait for USDA to start a new potentially decade-long rulemaking process. Will there be any farmers and ranchers left? Not if USDA continues with its pro-corporate agribusiness, anti-farmer and rancher policies. Last year, OCM and more than 80 other farm and food organizations called on President Trump to undo Secretary Perdue’s unjust action using his power of executive order to implement the Farmer Fair Practices Rules immediately. 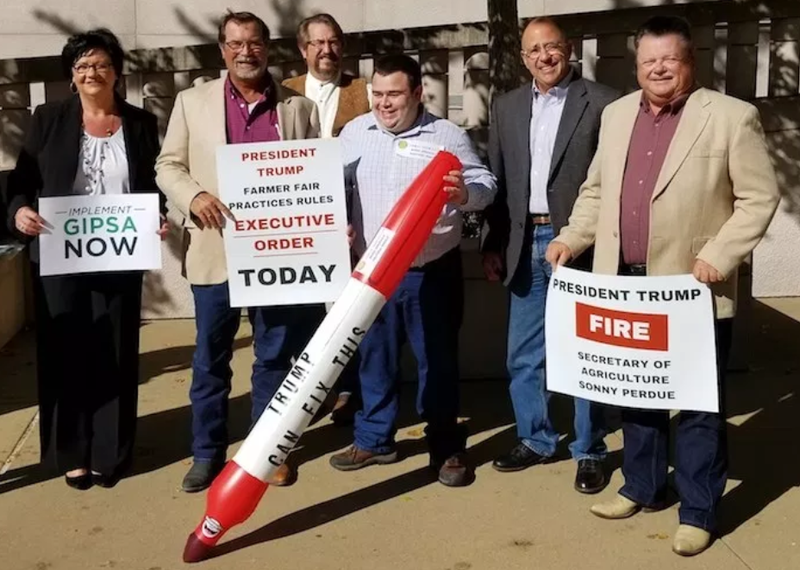 Outside the courthouse on Wednesday, a group of protesters with the advocacy group Family Farm Action renewed the call for the President to sign an executive order implementing the Rules. Watch a video from their rally. OCM and Democracy Forward held a press conference following the hearing. Watch the video to hear from Democracy Forward counsel Karianne Jones and OCM board members Jonathan Buttram, Webster Davis and Mike Callicrate. An audio recording of the 30-minute hearing is available online. To listen, select “September 2018” in the drop down menu and hit “Select.” Ours is Case No. 17-3723. Farmers deserve a fair shake in their business deals. We will be awaiting the court’s decision, but rest assured, we will not stop fighting until justice is served for America’s family farmers and ranchers.